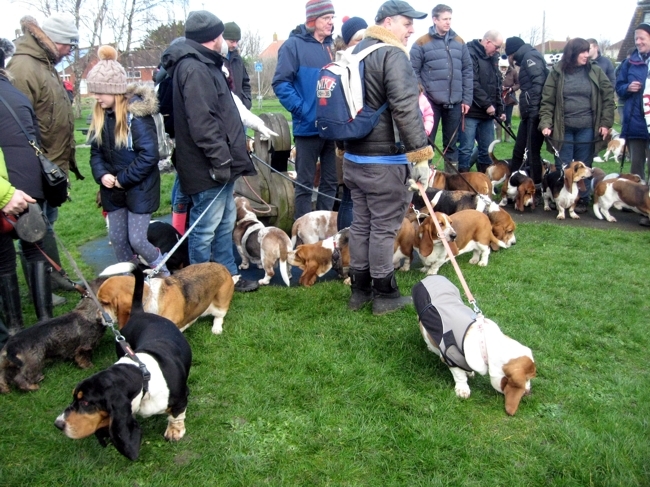 An unbelievable 68 Bassets at Burnham: is this a record? (Well it is for us). I didn't think we could ever beat last year's turnout of 65 - but hey, we did. Folk came from Fowey, Newent, Glos, Newport, Swindon, Pewsey and many from Bristol. Wonderful, wonderful . . . If you add in all the myriad of other breeds from dachshunds, chihuahuas, huskies, labs - there must have been 80+ four footed friends. And we had babes in arms. The weather was kind so unlike last year when many couldn't force their legs past the chip-shop - most carried on to the wooden lighthouse, completing a most satisfying 4¾ miles. And we made The Press (see here). So chaps . . . I know many of you prefer flat beach walks - and they have their place of course - but wouldn't it be nice to romp in fields and woods - and yes with the odd bump in between? We try and run eleven walks a year all over the West Country that includes two beach walks, this and Exmouth in October, so how about it? Try a little exploration in 2018? PS A thought. There must be other breeds that run longish walks but the only one we've come across was last year at Fingle Bridge. They were all German Shepherds, but everyone was held on a lead. No lovely chases and freedom that we enjoy with our hounds. Mm . . .